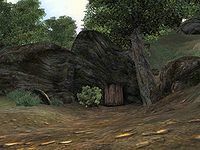 Wenderbek Cave is a small cave south of Cheydinhal containing goblins. It contains only one zone, Wenderbek Cave. This location's map marker (M on map) is named Wenderbek Cave (editor name WenderbekCaveMapMarker). The entrance door is W of the marker, 40 feet away. The lair of the Skull Breaker Tribe is rather small and contains a worthwhile amount of loot. Upon entering, everything appears quiet as the small tribe lives deeper within the cave, most of them guarding their totem staff. 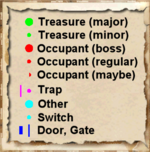 Take a left at the first fork in the tunnel for some minor treasure then head northwest to the intersection. Patrolling goblins may already detect you from the large western chamber and since the northern rooms contains nothing but bedrolls (b) and some minor loot, proceed headfirst into the large room and fight the opposition, including the War Chief at A. 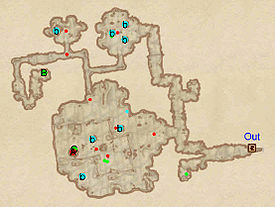 Pick up the loot from the chests and the totem staff in the large tent at C, then proceed north through the narrow tunnel for the boss-leveled chest at B. Finally, pay a visit to the northern rooms for the last chest and some rat meat, then exit the cave through door Out.